Coconut oil is dedicated for skin care of all skin and scalp types. It can be easily used in kitchen as a spreadable fat and in cosmetology: for massage and make-up removal, as a moisturising and regenerative product and for skin cleanse. During purchase we should focus not only on the properties of coconut oil, but also country of origin, composition and price. Coconut oil is extracted from coconut pulp of palm, which grows in a south-east Asia or in a north-west South America. Natural oil should be cold pressed and unrefined – otherwise it would loose all the valuable ingredients. This product has solid state of white and hard fat, but above 25°C and changes state into yellowish liquid. Original coconut oil has sweet scent and taste; you can sense nutty note of coconut. Because of its ingredients, properties and beneficial influence on human body is extremely valuable and expensive cosmetic. We will find in it saturated and unsaturated fatty acids, vitamins and minerals. Use of coconut oil is extremely wide. Cosmetic will come handy during hair and skin care. It consists of antiseptic and anti-bacterial properties, so it soothes irritations, limits itching and sebum secretion and reduces dandruff. It makes hair stop frizzing and electrifying, but also makes them glossy. It regenerates split ends and moisturises dry streaks. It leaves hair with protective layer against sun radiation, air pollution of external world and chemical substances in some of cosmetics. Coconut oil helps in combing, stylisation and blow drying. 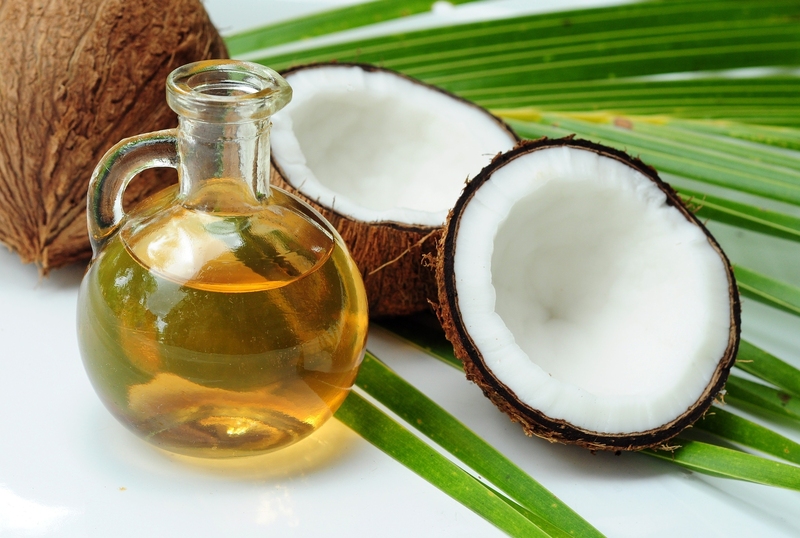 What’s interesting, coconut oil can be used as a hard fat and as a liquid preparation. You can add a bit of desiccated coconut or few drops of oil to your favourite hair mask or conditioner. This way properties of washing products will be enhanced with coconut oil ingredients. Coconut oil can be applied on dry and wet hair. Rub in, small amount of cosmetic into scalp, ends and the entire streaks. Then wrap your hair in a towel, and after about an hour wash your head with some delicate shampoo. Product can be also used as a leave on conditioner. In this case apply it only on the ends. If you apply coconut oil directly on scalp without rinsing, you can end up with oily hair and weighted down hair.